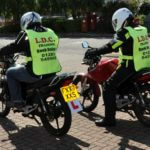 LDC driving school has been providing driving lessons, CBT and Direct Access motorbike training along with instructor training since 1991 in the Staffordshire, Derbyshire & Midlands area, covering Burton, Lichfield, Derby, Tamworth, Ashby, Swadlincote, Sudbury, Uttoxeter & Overseal. All from our central booking office at 18 Borough Road, Burton on Trent. We have a range of cars and bikes in manual or automatic to suit everyone's needs and have male and female instructors. After many years of training, the owners Les and Janet Churchley, along with a team of instructors, have built up an enviable reputation in the industry, as more people pass their test in Burton with LDC than any other school. 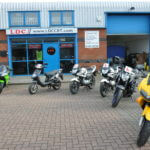 LDC have a large off-road training centre at the Pirelli Stadium in Stretton (Burton Albion's football ground - only 2 miles from the test centre) where we complete our Compulsory Basic Training for mopeds / motorcycles, and our trailer towing training. Our training centre is also used for our new starters who may not want to go on the road straight away when learning to drive. We carry out CBT 7 days a week plus Module 1 and 2 training. "Your instructor tony wood was fantastic I recommend very highly to everyone wanting to ride a motorbike he was brilliant." "Fantastic. Went from not being able to ride a motorbike to owning and riding a 600cc sports bike within a matter of days. Everyone was excellent, from Jo and Janet in the office to Matt and Dave on my training and Les for his advice on a motorbike." "Thank you all from office staff to instructors. I would recommend LDC to everyone. Staff is very friendly and welcoming and would put anyone's nerves at ease. I would give you all more stars if I could thank you all so much john." " Great day practicing for my MOD 1 test! Can't thank the team enough. Recommend the training given! " "I would reccommend this company to anyone who is looking for motorcycle, car or trailer training. 5 Star. Cheers"
"Would recommend LDC to anyone training was at a very high level but also very enjoyable thanks guys." "I would like to thank all at LDC for training and support, anybody looking to do there bike training this is the place to go. " We are Suzuki Franchised dealers, we also sell Mutt, Zontes, Sinnis, Motorini, Hanway, Keeway, Hyosung, Benelli. We cover all repairs and servicing and have a good selection on clothing, helmets and boots for all your motorcycling needs. Please call for details. Helmets from £40.00, Gloves from £18.00, Jackets from £45.00, and Boots from £54.00. Valid from 11/06/2016 to 30/7/16. Lichfield and Tamworth motorbike training only.